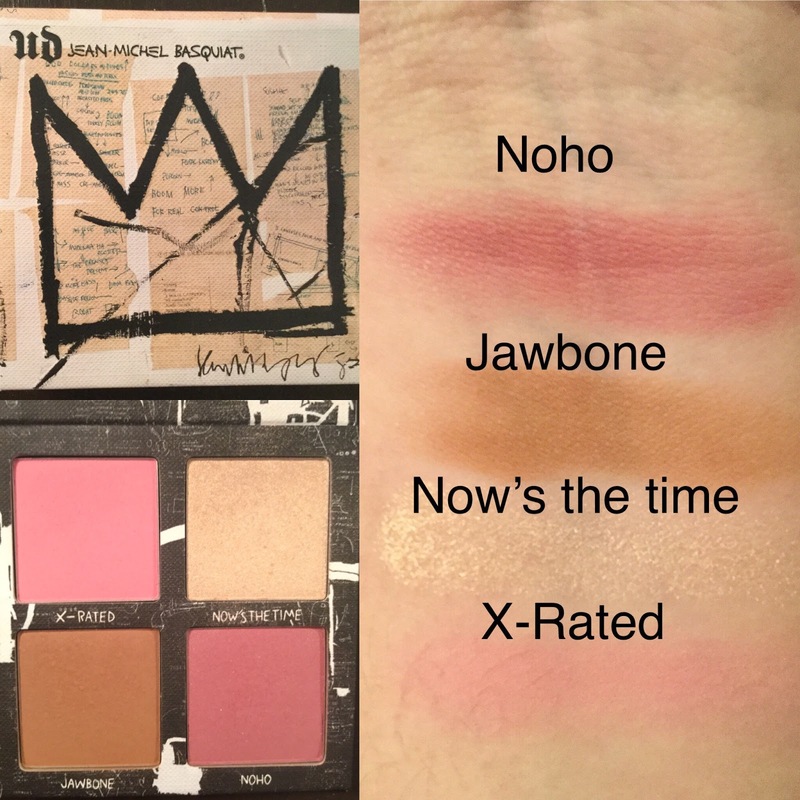 This limited edition palette was in collaboration with Jean-Michel Basquiat. If you're like me then you have no idea who this Jean-Michel guy is and why he teamed up with Urban Decay. Luckily, the packaging gave me a bit of insight on who this guy is. Essentially, he rose to fame in the 80's art scene in New York City and was the pioneer of he neo-expressionist movement. The packaging is a mini reproduction of Basquiat's artworks. This limited edition blush palette holds four shades of blush, bronzer and highlighter. (3 shades are supposed to be new but I don't know the Urban Decay line enough to know which 3 are new). Once you finish using this palette you can frame it on your wall like artwork. Normally, I would be able to give you a price point on this product and whether it is cruelty free or not. Unfortunately, this is a limited edition product meaning it is only available for a limited amount of time. If it was a permanent item I would be able to give you answers. I can say that this cost me max around 30$ but I think that is because I got this little palette on sale online at Sephora. This small palette contains 2 blush shades, 1 bronzer and 1 highlighter. I really like the formula of this palette. They are quite smooth, creamy and blendable. Of course, the shades are quite pigmented so always start with a light hand and build up your colour of choice. 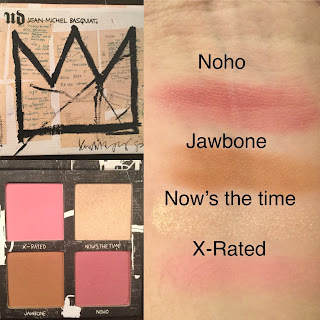 Let's start with the first top left blush which is called X-Rated. It's a nice cool tone pink which for a pale skinned like me looks natural on my cheeks and complements my skin tone. I don't know how it would fare on other skin tones but if you have a similar skin tone to mine it would look great! Moving onto the highlighter on the top right. As seen in the swatches, it doesn't really swatch all that well. And honestly? I have no idea why. But I cannot emphasize how pigmented and amazing this shade is! It is a bright gold that looks great on my skin tone. Truthfully, I feel like this is one of those highlights that would look amazing on any skin tone. I can with certainty say that this would look fantastic on deeper skin toned girls. Now onto the bronzer of this palette. Jawbone which is on the bottom left is a deep toned bronzer and I have to be honest it took quite a while for me to figure out how to use this bronzer without looking like an orange. Normally, the best type of bronzer for pale toned skin is a cool toned bronzer. Normally, warmer bronzers like this one pair better with medium to darker skin tones. But I found that if I use a super light hand that I can actually make it work on me. It was nice to finally use a bronzer because I am so not a bronzer girl. And for the last blush in this palette. On the bottom right corner we have Noho. Now this is the darker toned blush. It's a deeply toned mauve color that is a nice counter blush to x-rated. Again, deeper toned blushes and bronzers are trciky to use on my skin tone but I found that if I used this blush more on the outer parts of my cheeks then it helped shape and frame my face. I am going to give this palette 4.5 stars on 5. I loved the formula and how blendable these products were. Not going to lie, I hate that this was a limited edition palette because I feel that a lot of people would have benefited being introduced to these shades.I could care less about the whole collaboration and enjoyed more how well I made these shades work on my skin. Plus it's a all in one palette to get my blush, highlight and bronzer. I really wish that I knew if this was cruelty free or not. But otherwise, I can safely say I won't stop using this cute little palette. Let me know if you guys had the chance to try this out before they stopped selling it. Of course, leave a comment down below on what you thought.